Under the proposal, if the sum of a school district’s equalization and special adjustment aid entitlements is less than an amount equal to $1,000 per pupil times the district’s aid membership, minimum aid would be paid in an amount equal to the difference between those two numbers. Reduce the reliance upon the local property tax as the sole source of revenue for educational programs. Guarantee that a basic educational opportunity is available to all pupils regardless of the local fiscal capacity of the district in which they reside. Because a district’s ability to fund expenditures is measured by its property wealth per member, districts with a higher property tax base receive less aid from the State. In 2017-18, 54 rural lake area and suburban districts with high property values are receiving less than $1,000 per pupil in general aid (equalization and special adjustment), compared to a statewide average payment of $5168. Fifteen of these districts do not qualify for equalization aid, but only receive special adjustment aid which is a “hold harmless” payment equal to 85% of a district’s prior year’s general aid payment. Six high property value districts no longer receive any general aid payment. The establishment of a $1000 per pupil minimum aid guarantee in the school aid formula is not only a matter of fairness, but it would address concerns that the continual loss of state general aid among high property value school districts is placing an unfair burden on local taxpayers. 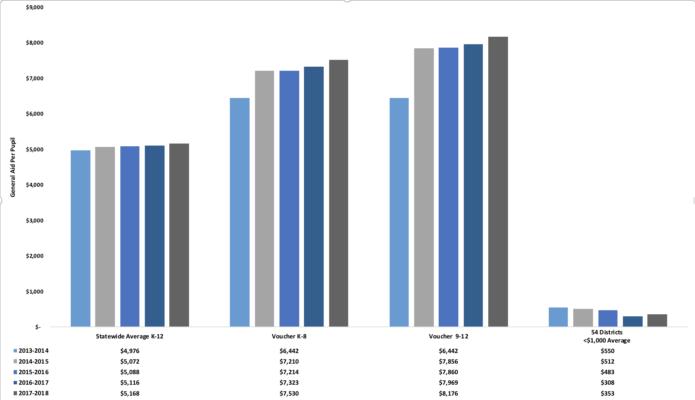 Consider that the 54 school districts currently receiving less than $1000 per pupil had general aid payments totaling $30.3 million in 2010-11 compared to $14.3 million in 2017-18, for a reduction of $16.0 million, or -52.7%. The statewide change in aid payments during the same period of time is a reduction of $50.5 million or -1.1 %, to $4.24 billion in 2017-18 from $4.47 billion in 2010-11. In the 2017-18 school year, 54 high property value school districts are receiving an average $353 per pupil; of these districts, Geneva J4, Mercer, North Lakeland, Washington Island, Minocqua J1 and Norris no longer receive any general aid (equalization aid and special adjustment aid). Without a minimum aid “floor”, high property value school districts will continue to experience significant reductions in state general aid, as shown in Figure 2. The -52.7% reduction in general aid in 2017-18 compared to 2010-11 means that those public school costs have been shifted to property taxpayers in rural, lake area, and suburban high property value districts. During the same time period, the statewide reduction of aid is -1.1%. Average per pupil aid for high property value school districts has similarly declined by -50.5% between 2017-18 and 2010-11, compared to a -0.8% statewide reduction. According to the Legislative Council, the proposal appears to increase the uniformity of the state school funding system by providing a minimum funding floor of $1000 per pupil in addition to the constitutionally required educational opportunity floor. According to the LFB, had the proposal been in effect for the 2017-2018 school year, 53 high property value school districts would have received $25.7 million, which is just 0.6% of total net general aid payments of $4.884 billion. The intent is that the minimum aid guarantee would be funded as part of a statewide increase in the general aid allocation. Where are High Property Value School Districts Located? 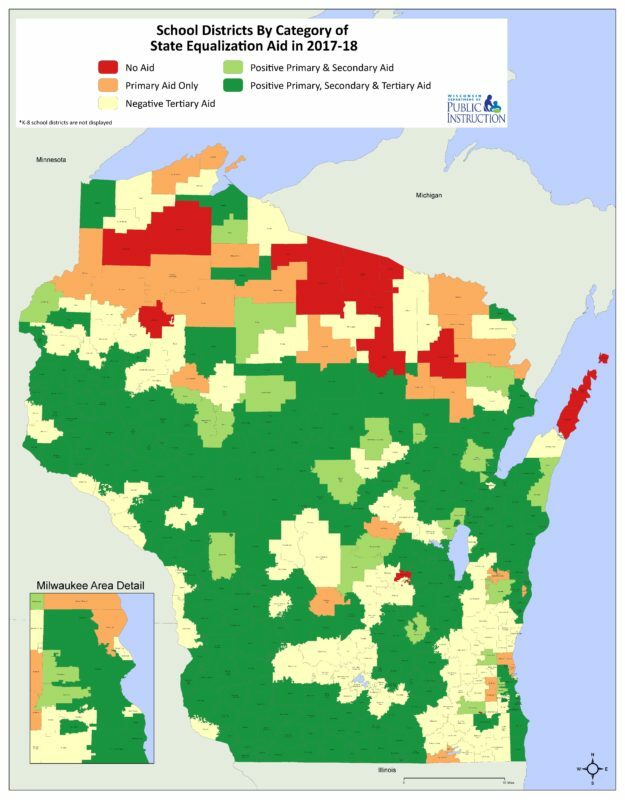 21 “No Aid” School Districts located mostly in small lake area communities in northern Wisconsin, do not qualify for Equalization Aid (shown in red on map and list). 33 “Primary Aid Only” School Districts, located in resort area and suburban communities, only receive Equalization Aid under the first tier of the school aid formula (up to $1000 per pupil) (shown in salmon on map and listed in black). © 2018 | Fair Aid Coalition | All Rights Reserved.